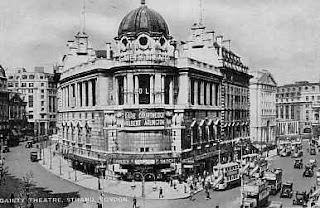 So...some of you may know that the project I'm working on right now, which I'm sorry to say I've been slightly cryptic about, takes place in the 1890s in England (so far) and partially involves one of my main characters getting herself into the London theater scene. She finds work at The Gaiety Theatre. So I'm finally writing a scene where Victoria and her friend go see a show at The Gaiety. It's January 1894, so A Gaiety Girl is the show that was running at the time. that building is the New Gaiety Theatre--it was built in 1910, years after when my story takes place. So then I was searching around (God bless Google) for descriptions of the interior of the theatre and came across a few pages and articles that mentioned the old Gaiety Theatre--the one Victoria would have seen in 1894--was kind of down the block and across from that newer Gaiety. Also, this page had a floor plan, newspaper article links, photos, and a full-on description of the interiors!!!! The old Gaiety was demolished in 1903. No, it was not as pretty-looking as the new one in the picture. I actually missed the reference to the new building being "new"---I thought it was the only one, but apparently not. Glad I figured it out now! I've heard of more than one author discovering their mistake long after the story is in print. Some publishers check the facts and some blindly trust the author. Red faces all around because you can count on someone point the mistake out eventually. Actually, there's a mistake in Pearl like that--it's one line, a reference to a historical person who was already dead by then and it made it sound like he was still alive. It happens, of course, but yeah, I'm glad I was able to dig around a little and catch this one, only because this particular theatre becomes important in the plot.